One of the first things that I learned how to cook when I made the switch to real food years ago was a whole chicken. I had read about how much more superior pastured meat was compared to conventional. I made my mind up this was where I was going to start. However! OY – organic pastured boneless skinless chicken breasts were pricey! I noticed that whole chickens were less per pound (and in most cases even less per pound than conventional boneless skinless) so I decided to make that work. One weekend of figuring out how to cook a whole chicken, and I completely fell in love with real food. Why? Because I could make it work on my crazy schedule. I could feel good about what I was feeding my then growing family. I didn’t want my daughter (I only had one at the time!) growing up on the same hormone infested meat I did. SO HERE’S THE DEAL! Let’s make this work for your family! Hop out to your farmers markets this weekend, or ask around at a health food store near you where you can find a farmer that sells pastured chickens. After you find a good source you can get your chicken cooked up. Depending on the size of your family, the leftover meat will last you up to a week for stir frys, soups, salads, sandwiches, etc! Simple! In the last 6 months I have moved from doing 1 whole chicken in a crockpot every week, to doing 2 whole chickens in my big oven roaster every 3-4 weeks. As my family has grown and our schedules get busier, I have been trying to find ways of cutting my kitchen time down. I freeze up the leftover meat in bags so I can pull them out for quick stir frys, soups, or salads during the week. We could easily go through an entire chicken every single week, but in our budget right now, I make 2 chickens work per month. The meat stretches very well when you put it in soups and stir frys. So here is how I went from not knowing a thing about cooking, to falling in love with cooking real food and feeding my family nourishing meals 😉 It doesn’t get any easier than this! 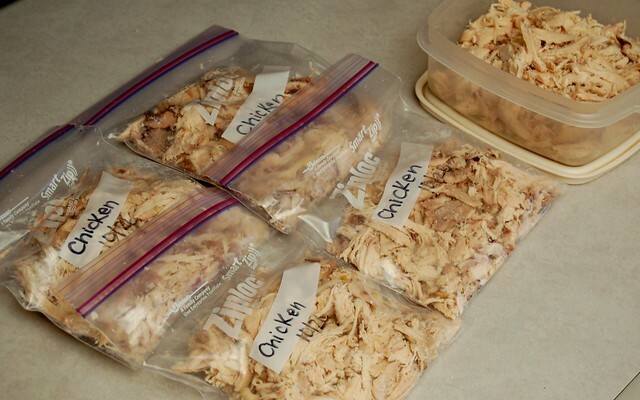 Making chicken in bulk is so great. You can use the leftovers in many ways through the week, and freeze some for when you don't have time to roast another one just yet. Throw all the veggies into the bottom of the crockpot or oven roaster. Rinse the chicken(s) inside and out, and lay breast DOWN in the crock or roaster. Fill the crock or roaster with water halfway up the chicken(s). Cook on low in the crockpot 8 hours, or at 275 degrees in the oven roaster for 8 hours. I don’t skin the carrots, or chop the veggies nicely – or even chop off the ends. What you see in the picture is how I put them in. I just throw them in as is. I usually buy these veggies organically so I don’t mind. And usually I am throwing the bones right back into the crock with the leftover veggies to make stock, so we don’t plan on eating them. It is so much easier to tear the chicken apart when it is warm. I usually tear it apart after we have dinner and just shred it with my hands into freezer bags. It goes fast. SAVE the bones and carcass for making chicken bone broth! The minerals you leach from the bones of pastured chickens is extremely healing to the gut, and your immune system will never be stronger than getting soups using bone broth in weekly! This is one way you can get the most bang for your buck in buying whole chickens too. You can freeze the bones if you don’t plan on making your stock right away. 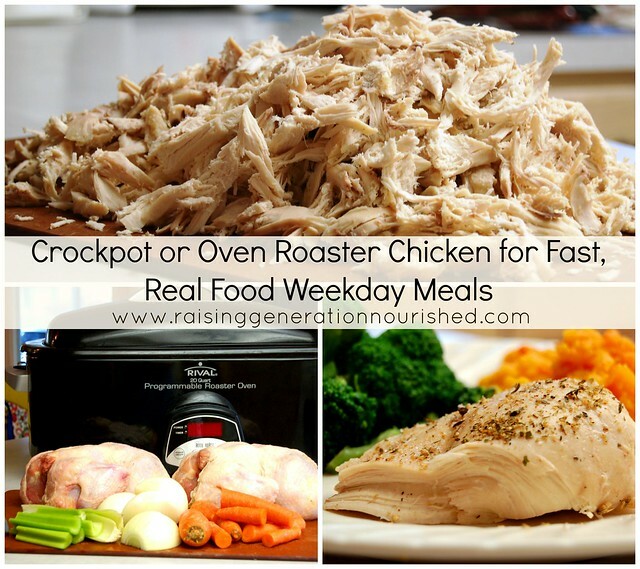 Make one day a week or every other week “chicken day” so you know you can plan on having chicken for your dinner and then shredding the leftovers for the freezer or the rest of the week. So talk to me! Let me know how you are making this work for your family! How can I help? I can’t wait to try this! I am looking forward to learning how to cook real food for my family. Thank you for sharing your recipes. Your welcome Michele! Let me know how it turns out! This looks great! One question: do you reuse the water you cooked the chicken in or replace it with fresh water? Hi Christina! Great question! I just keep everything in the roaster, toss the carcass back in with some apple cider vinegar and make bone broth! Hi Renee. Love the idea of letting it cook all day, and be ready when I return home. I like the recipe, too. Simple is always best. 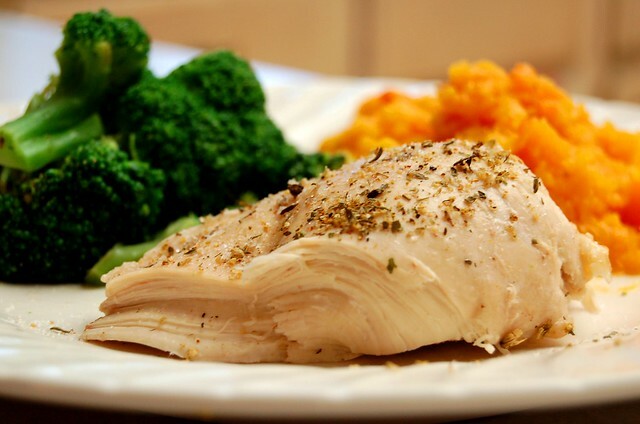 Question – no salt or any seasonings when you cook the chicken? Thanks for sharing the information. Can’t wait to try it. HI Lulu! I don’t season it when I do chicken in the crockpot because I just tear apart the meat and use it for different dishes throughout the week 😉 If you want to season it you certainly may though! Sea salt/pepper/all purpose season is usually what I use when I roast a chicken in the oven! Makes me sorry I gave AWAY our crock pot. It just wasn’t working for us. But now I wish I had it so we could try this recipe! Yum! We do our chicken like this too. For our family it’s tough to shell out the big bucks for the quality chicken.. this is good inspiration to make it work and stretch out those leftovers, though. I have been doing this for years as well. The only difference is I never add water. My crockpot is always full of juices (almost overflowing when I cook two chickens) when they are done cooking so I guess I don’t see a reason for the water? Sounds great Sonja! As long as the bones are submerged you’re good! Looks great. I was just curious about how many lbs are the whole chickens you use? Sorry one more question. When making the chicken broth, do you let the left over water/juices cool before adding the acv to it and putting the bones back in? Nope – I just add really cold water to the juices and it is cold enough 🙂 Sometimes I don’t get to tearing the chicken apart until well after dinner if the kids are needing me more and it definitely cools off on its own then! Thank you so much, just started mine in the crockpot now! Hi Danielle! Great! The chicken totally freaked me out when I first started too 😉 I made my husband do it all the time! How long do you roast it the second time, for the broth? So I can use the left over water from the crock pot chicken to make the broth instead of all fresh water? Thanks! Hi Jamie – yes use the same water although you will probably want to add some more water to be sure the bones are fully covered by about an inch. Hello there! I have been teaching myself kitchen ‘basics’ for the last couple of years and feeding my family with whole foods. It is so much easier with blogs like yours – a heartfelt thank you! Question – you don’t eat the veggies? And you use the same veggies in the broth? What do you do with the skin? Hi Debra! Good for you! I keep the veggies right in the pot, throw the bones/carcess right back in (yes including the skin sometimes because I just don’t have the time to separate everything!). When I roast a chicken in the oven the skin gets seasoned and super crispy and it is so yummy so we eat it then 😀 I hope that helps! This may sound like a really dumb question, but how well should the chicken fit in the crockpot? After buying the chicken, it looks pretty big for the crockpot. It does all fit in there with the lid on, but it seems like it wouldn’t get cooked all the way because it looks so big in there. The back of the chicken is touching the lid. It is 5lbs exactly. I just want to make sure it will fully get cooked if that makes sense? Also, when I was washing my chicken there was the center part that had something wrapped in paper. I threw that away, but in the future is that something I should take out of the wrapper and let it cook with it? Hi Sarah! No dumb questions here 🙂 I’m glad you asked! It should all fit with the lid on well but you just might have a smaller crock pot. 5 pounds is a pretty typical size pastured bird. You can break the backbone a little to get it to fit in there if you want 🙂 It won’t be pretty but it doesn’t have to be! Fill the water halfway up the bird and cook for at least 8 hours on low and it will be cooked! I’m thinking the bag probably had the chicken livers and or other organs in it. Yes save those! Chicken liver is extremely nourishing to eat and can be frozen. Other organ meats can be frozen and ground up into meatballs, meatloaf, and/or hamburger patties for extra nourishment! When saving the bone after to make broth do you keep the juices from the ccrock pot and put it in your broth. Also should you transfer the veggies from the crock pot to make the broth? Thank so much! Hi Jessica! I do actually keep the juices from cooking a chicken – it is called meat stock. A little different than bone broth but still has many benefits. I do transfer the veggies from cooking my chicken to the crockpot for making broth usually. I hope that helps! 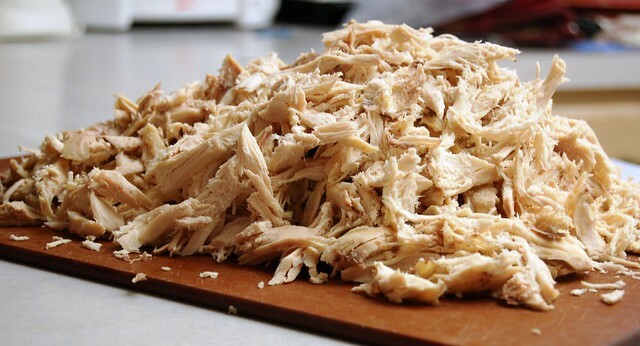 what size portions of shredded chicken do you freeze? 2cup? Hi Erin! Yeah it’s close to 2 cups – a little less most often. I take a heaping handful and put it in the bags – so it is a little over a cup. 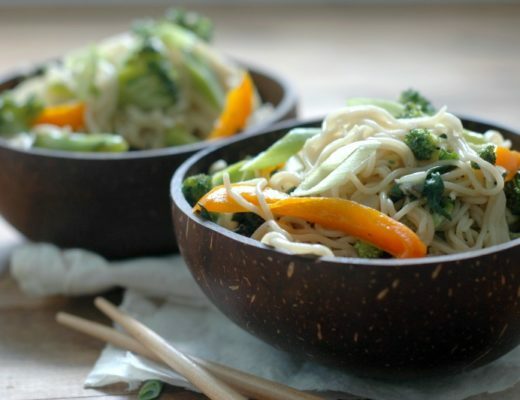 I try to figure about what I would be tossing into a stir fry or soup. I hope that helps! I am looking at getting a roaster and was wondering if the one you use gets really hot on the outside? Hi Erin! It does get hot on the outside. I don’t feel like it warms up the kitchen much – more like how a crockpot would. I hope that helps! Thanks so much for your recipe and all your insights on your blog. 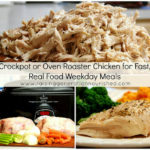 I’m making the crockpot chicken as I type this and have a quick question – i would like to make bone broth for my 7 month old daughter after the chicken is done. Do you drain the water and veggies after you cook the chicken and start again? Or, do you just add the carcass back to the water and let it sit? Hopefully this isn’t a silly question. Hi Heather! No silly questions here 🙂 The liquid left after making your chicken is called “meat stock” – it is good for using in soups, stir frys, and stews. You can strain it off and use it how you wish. Then for the bone broth, I just put the carcass back in with fresh water and veggies. Does that help? Thank you for sharing your story and your recipe. I have a whole chicken in my freezer that I want to roast. Does the bird go into the crock pot frozen or do you thaw it first? Do you adjust the cook time for frozen vs thawed bird? Hi Rebecca! I would thaw the chicken out first. It won’t cook as evenly because the middle will take longer to thaw and start cooking. I hope that helps! 1. Do you skim off any fat from your brother before freezing for baby? 2. Do you add anymore water after taking the chicken out and replacing the bones, or do you start with fresh water? 3. Do you have to let the water cool before adding your ACV? 4. How long do you let the bones sit? 24 hours? 1. Yes – chicken fat is a bit bitter – it is find for frying in or cooking in but I would skim it before drinking. 2. Save the juices from cooking the chicken – it is called meat stock – a little different than bone broth but it is still very gelatinous and healthy – its like free broth for making soup or cooking rice or whatever in! Fresh water in for making the bone broth. 3. When you add your fresh water that should be cool enough for the ACV. 4. 30 minutes for the ACV soak – there is a bone broth recipe on the blog both Instant Pot and Crockpot versions if you want to use the search bar at the top for that and go more in depth! 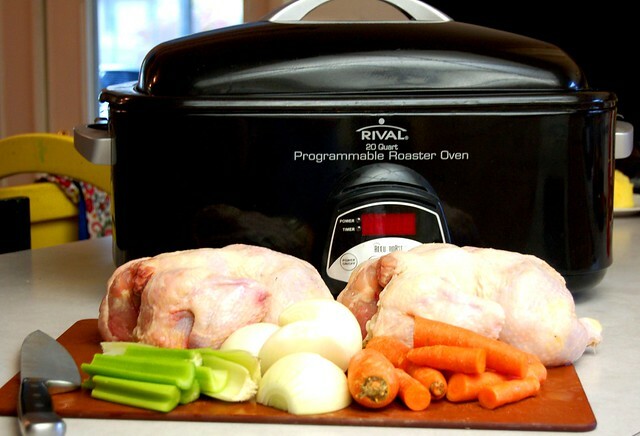 1) Cook 1 whole chicken in crockpot with the veggies and water halfway up the chicken for 8 hours. 3) Throw bones back in crockpot with remaining veggies & water from cooking the chicken (add more water to make sure bones are covered). Add ACV and let sit for 30-60 mins without heat on, then turn heat on and I let it cook for 24 hours. 4) Take bones out and strain out the broth. At this point is it called “Chicken Bone Broth”? Now I am reading elsewhere and seeing on this thread that you can cook your chicken and strain the liquid at that point and it is called “Meat Stock”. Is this correct? So then going forward what I should I do? Strain out this first liquid as “meat stock” and save it? Then would I put back the bones with fresh water and ACV, let it sit 30-60 mins and then cook on low for 24 hours to make the “bone broth”? Would meat stock and bone broth be used in the same way? Also, do you think any nutritional value is lost since I technically was continuing to cook my meat stock (since I didn’t strain it first and put fresh water in the crockpot with the bones) for another 24 hours to have my “bone broth”? My husband likes it the way it is, but I just wanted to check on all this and get it figured out. Hi Sarah! Yes you are correct! When I wrote this post – which was quite a while back, that is actually what I used to do. 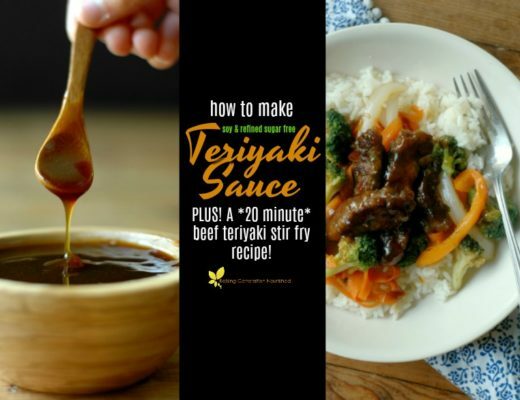 I never saved those juice from cooking the chicken (called meat stock) – because I never really had a use for them with not as many mouths to feed in the house! With the housefull I have now, the meat stock really helps because it is like free broth for making soup with! 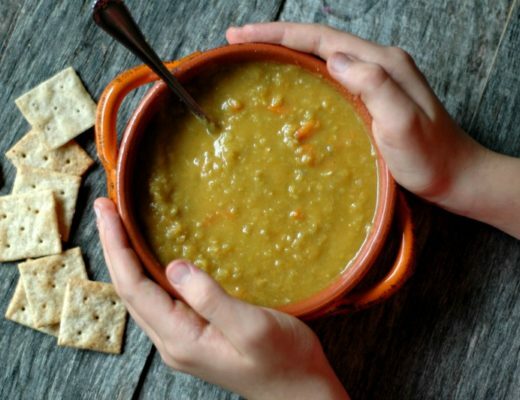 It has a slightly different nutrition profile but it is still very good and nourishing. No you are not ruining it by cooking it in with your bones to make bone broth. I hope that helps! I love your website. I just got an Insta Pot and was hesitant to try. Browsing your website I got the confidence to try it out this weekend. So thank you!! 1.) I have a question on cooking the two birds in the oven roaster? Other than the carrots ( I’m omitting celery and onions because of sensitivity) on the bottom of roaster do you put any liquid in it? 2.) Is there a substitute for the celery and onion? 3 . )I want to try the tomato soup and was wondering what would happen if i left honey out of recipe? I’m a diabetic and don’t want the added sugar? If your give me a substitution for the onion I’ll replace it in this recipe too!! Thanks I look forward to trying so many of your recipes. Hi Judy! Welcome, and thank you for your kind words! I’m glad you mustered the courage to use your Instant Pot! 1.) Yes, you’ll want to fill it with water about 1/4 of the way up the birds. 2.) The celery and onion do give the broth that aromatic flavor but leaving them out will not hurt anything. I’m not sure what veggie families the celery and onion are in so I would assume something like celeriac would not work in place of celery? I’m not sure – it tastes very similar to celery. I hope that helps some. 3.) The honey takes some of the acid bite out of the tomatoes but it can definitely be left out – I do that on occasion and it tastes fine 🙂 That onion substitute is really throwing me off! I really am not sure what I would do! Green onion? Is that the same family as onion? Maybe try googling onion substitute and see what you get! That is one I haven’t seen before! Let me know what you come up with! Is shallot in the same family as onion? I wonder if that would work instead? Leeks for the onion might work well too! Could I cook 50 chicken breasts in an electric roaster all at once to make bbq pulled chicken sandwiches? Hi Denise! I’m not sure what settings to use for that as I have never done it, but I’m sure it would work!